According to a new market report published by Transparency Market Research titled “Digital Servo Press Market (Type-Less than 100KN, 100KN - 200KN, and More than 200KN; Motor Type - Positional Rotation, Continuous Rotation, and Linear; Application - Automotive, Motor and Electronic Industry, Aerospace, and Others (Medical Equipment, Robotics, etc. ); - Global Industry Analysis, Size, Share, Growth, Trends, and Forecast, 2019-2027,” the global digital servo press market is expected to reach a value of US$ 1,294.0 Mn by 2027. In terms of value, the market is estimated to expand at a CAGR of 5.8% during the forecast period from 2019 to 2027. In terms of volume, the market stood at around 26,401 units in 2017. 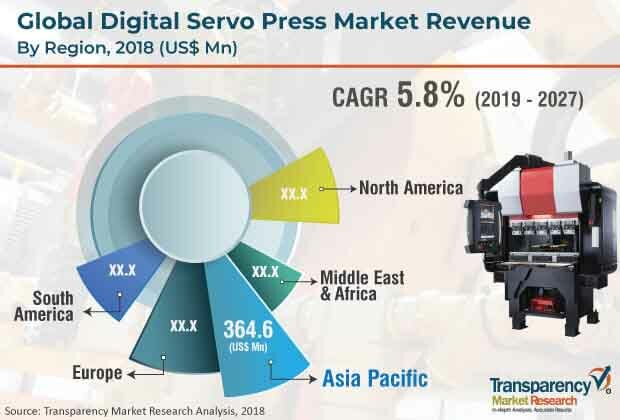 The Asia Pacific digital servo press market is expected to witness the highest growth during the forecast period both in terms of value (US$ Mn) and volume (Units). The market witnessed considerable growth in the Asia Pacific region because of increasing technology breakthrough in digital servo presses in Japan, China, and India. The digital servo press market is influenced by market dynamics with driving factors such as rapidly growing automotive sector and rising adoption of digital servo press in the aerospace sector. In terms of type, the More than 200KN segment is anticipated to gain the largest share with total value of US$ 544.2 Mn by 2027 at a CAGR of 5.5% annually. However, high initial cost and requirement of skilled professionals for the manufacturing process are the major challenges restraining the growth of the market. Nevertheless, the market is anticipated to grow due to the growing manufacturing sector in the Asia Pacific region. Some of the key players profiled in the global digital servo press market are FEC Inc., Dai-ichiDentsu Ltd., Hoden Seimitsu Kako Kenkyusho Co.,Ltd., AMADA MACHINE TOOLS CO., LTD., Promess Incorporated, Sanyo Machine Works Ltd, C&M Robotics Co, .Ltd., Stamtec, Inc., Komatsu America Industries LLC, Coretec, Inc., and Janome Industrial Equipment.